When he has his victims he drags them to his flat, lays them on a plastic sheet (coz hygiene is everything!) and devours them. What he leaves behind he either buries or burns. He misses his girlfriend terribly and she haunts his dreams and ever increasing hallucinations, his only comforts being alcohol and his collection of photos of Sarah that he regularly pleasures himself over. As his condition worsens he gets sloppy and after an almost bungled attack that he only just manages to get away with he trips and breaks his leg when trying to move his latest meal. He rectifies this situation by drilling holes in his leg with his trusty Black and Decker and screws on a metal plate. Whilst we are with Mark on his horrendous journey we also follow Sarah who still has no idea what has happened to him but is trying to deal with this apparent abandonment by moving on with her life. When we near the end Mark is unrecognisable. He is rotting away before his eyes, his hair and skin is falling off not to mention a rather important organ. Suffering from almost constant seizures now it’s hard to imagine how he manages to feed himself and we leave him lying on the bed with what is left of his memories, his tape recorder and a bottle of chloroform. This is a bit of an unknown film and if it wasn’t for the people in the know bringing it to my attention I would have gone on blissfully unaware of its existence and denied myself a truly awesome British zombie film, so thanks guys!! I found the story flowed incredibly well throughout, even though some of the hallucination sequences were a little confusing it picked back up. You really feel for Mark (Giles Aspen) who spends a fair amount of time on his own either convulsing on the floor, dismembering bodies or getting over friendly with photographs, he also did all his own stunts as well. There are some very good gory moments with well done half eaten bodies that due to how they are initially taken down may or may not wake up whilst being eaten! For a low budget film they have concentrated on accurate make up and effects. I also love how it is not your average zombie storyline either. The effects of this particular infection does not kill you instantly nor even in a few hours, there is no reanimation, you don’t die and come back craving brains. You’re still alive when you are driven to cannibalism and you’re still alive as your body is very slowly rotting from your bones. I think this in itself is a rarely used and brilliant take on things. With all this early praise though I would like to point out a few small discrepancies, one part being, Sarah alerts the police that Mark has been missing for 3 weeks. They fill out a report and so on then nothing, some of the sequences of Sarah talking about Mark could be under police interview I guess but they don’t really make that very clear, you certainly hear nothing of a search for him. Also at one point Mark goes back to the house he shared with Sarah after a short train journey so its obvious he is not that far away or being particularly incognito either. Then there is the case of his victims, at some points he grabs them off the street in broad daylight surely someone would have seen this and found it a bit odd? He doesn’t dispose of the bodies very discreetly either, his flat appears to be in the middle of a city if one of his neighbours were to look out their window of an evening they’d see him burying ominous bin bags or burning clothes late into the night, pretty suspect behaviour really! I realise its not really meant to be about that though, it’s about the struggle, pain and despair of Marks situation I get that but it did annoy me a little. Doing background research on this film I, of course, came across previous reviews slagging it off calling it “over serious and predictable” but I also found quite a few others giving it the love it deserves. Apparently Marc Price had said if he had known about the existence of I, ZOMBIE he probably wouldn’t have made COLIN which I would take as a compliment as although slightly similar in premise they are both done differently and are amazing films. Fangoria initially released I, ZOMBIE in 1998, it was released on VHS in 1999 and on DVD in 2014 in North America. You can only get this film on DVD from the States and even the VHS format over here in the UK will cost you twenty quid! It was 4 years in the making and was written, directed and produced by Andrew Parkinson who also did the music. On the subject of the music, for a film started in the mid 90’s and released in 98/99, the incidental music is very typical 80’s style synth/ Casio keyboard music which I really love and anytime there is a stereo on it seems to be playing 80’s pop music, I guess that and the fact I watched it from a VHS copy with that soft, older feel to it all add to the fact that I, ZOMBIE felt, to me, like it was older then it really is. In conclusion this low budget gem is a fantastic example of a different take on a zombie pandemic, it makes you sympathetic towards Mark but there are also the little pieces that make you smile, it is by no means “over serious”. Maybe sometimes the acting could be considered a tad wooden which I suppose could fuel the over serious debate as sometimes you think they could put a smidge more emotion into it but instead they just end up looking a bit awkward but I can totally overlook that in this instance. 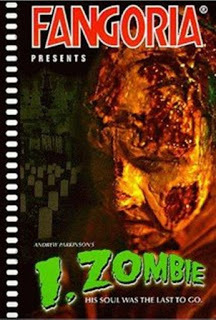 It’s a great idea, story and pretty good execution, a definite must see for any zombie fan.